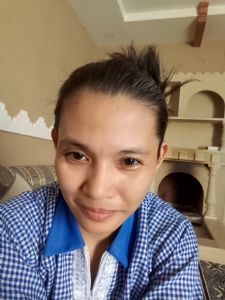 Jenifer - Housekeeper, Maid / Cleaner, House Manager PHILIPPINES Philippines As a housekeeping. I am Jenifer Cumbe, 41yrs old live in the Philippines with 4kids ages 19, 17, 9 and 2yrs old. I graduated my college degree in the year of 1999 as Bachelor of Science in Secretarial Administration. I am now working here at Riyadh Saudi Arabia as a household worker. I signed a 2yrs contract, but i am willing to relocate anytime at your country as long as i have a job offer. My hobbies are reading, playing with kid. I like kids, playing with them. I have nothing to be dislike because i am a kind of person who is very adaptable in any kind of people. Since i have a kids i can take good care of children even a newborn one. I can do as well the household chores without any supervision. I can also supervise the student in their school and outside activities and even their homework. Can cook and preparre meals. If you are going to hire me as your employee i asure you that we can have a harmonious relationship and do my very best to be a big help to you and to yoir family member. As a housekeeping. I can perform all the dutries and responsibility of a housekeeper, like ironing clothes, cooking and preparing meals. Cleaning, dusting, mapping and using vacuum. washing dishes. I can also do some erands like paying bills, going to the grocery buying what are neede in the kithen and cleaning cleaning material. arranging and changing bed sheet and cleaning bathrooms.